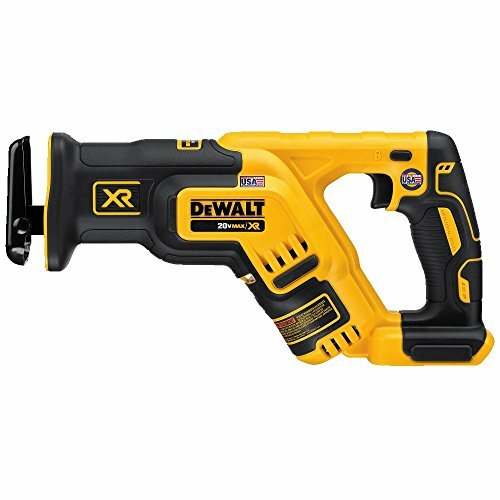 The DEWALT DCS387P1 20V MAX Lithium Ion Compact Reciprocating Saw Kit (5.0Ah) boasts of a compact and lightweight design at only 14.5" in total length; fits between studs and allows users to make cuts in confined spaces. It features a 4-position blade clamp that allows for flush cutting and increased positional versatility with tool free blade changes. The 1-1/8" stroke length delivers faster cutting speed, and a variable speed trigger with 0-2,900 spm provides increased blade control for precision cuts. The pivoting shoe provides increased versatility while cutting. It also offers a bright LED light illuminates dark work areas for better visibility. 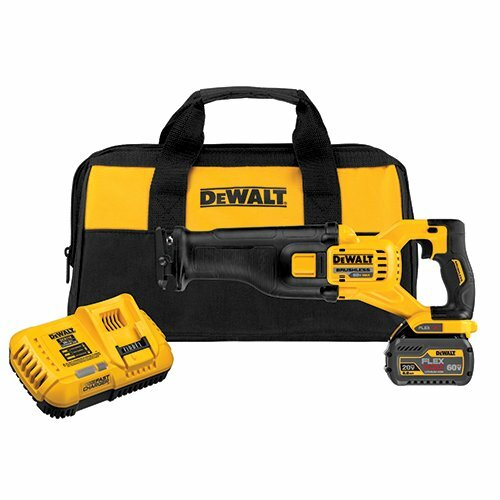 Includes: (1) DCS387 20V MAX Compact Reciprocating Saw, (1) DCB205 XR Li-Ion Battery (5.0Ah), (1) DCB101 fast charger, and kit bag. The DEWALT DCS388T2 flexible 60V MAX* Brushless Reciprocating saw kit features FLEXVOLT technology; the world's first battery that automatically changes voltage when you change tools. The flexible battery is backwards compatible with our 20V MAX* tools so you get up to 4X the runtime. 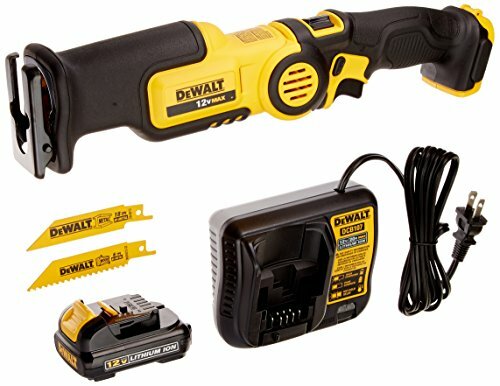 (**With FLEXVOLT 60V MAX* battery when used with DEWALT 20V MAX* tools.) 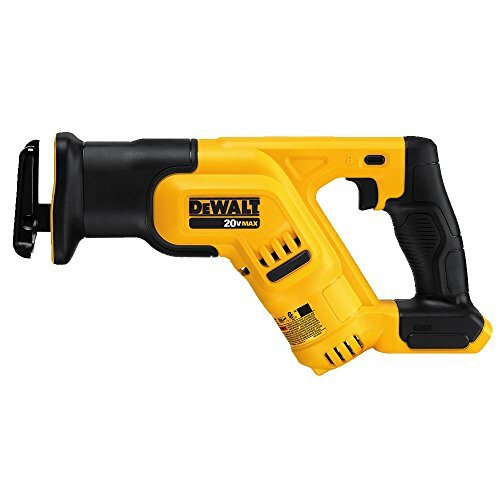 you can slide the battery into a whole new lineup of 60V MAX* and 120V MAX* tools from DEWALT. This reciprocating saw allows the power of corded with the freedom of cordless. It offers a keyless lever-action blade clamp for quick and easy blade changes, along with a variable speed trigger that allows user to instantly control speed. The 0 - 2950 SPD and 1 1/8" stroke length delivers fast and efficient cutting with a pivoting shoe that provides leverage for different applications. It can cut up to 158 cuts per charge in 2x4 using a flexible battery. This saw also has a LED light that helps to illuminate dark jobsite work areas, and features a rubber over mold grip for user comfort. Kit includes: (1) DCS388B 60V MAX* Brushless Recip saw, (2) DCB606 batteries, (1) DCB118 charger, (1) low vibration Recip saw blade. The DEWALT DWE304 10 Amp Reciprocating Saw features a powerful 10.0 amp motor designed for heavy-duty applications. It has a 4-position blade clamp that allows for flush cutting and increased versatility, a fixed shoe, along with a keyless lever-action blade clamp for quick and easy blade changes. This recip saw operates at 0-2,800 strokes per minute and offers 1-1/8" stroke length deliver fast cutting. It also has a variable speed trigger which allows the user to instantly control speed at the trigger. Common applications for this versatile saw include: wood and nail embedded wood, light to heavy gauge metals, drywall and plaster, plastics, rubber, fiberglass and composites. 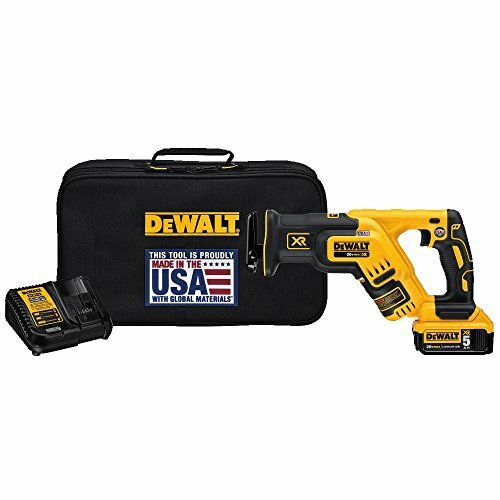 The DWE304 is backed by Dewalt's 3 year limited manufacturers warranty. The DEWALT DCS310S1 12-Volt MAX Pivot Reciprocating Saw Kit is ideal for a variety of professionals including remodelers. This Saw features an adjustable 3-position pivoting handle that allows user to make difficult cuts in confined spaces. It offers a 9/16" stroke length that delivers fast cutting speed, along with a variable speed trigger with 0-2700 spm which provides blade control for precision cuts. A keyless lever-action blade clamp for quick and easy blade changes, and a pivoting shoe that provides versatility while cutting. A bright LED light illuminates dark work areas for better visibility and the blade reverses for greater access to tight spaces and flush cutting. Includes: (1) 12V MAX* Li-Ion Battery Pack, 30 minute charger, (1) 4" 6 tpi wood cutting blade, (1) 4" 18 tpi metal cutting blade, kit bag. The DEWALT DCS388T1 flexible 60V MAX* Brushless Reciprocating saw kit features FLEXVOLT technology; the world's first battery that automatically changes voltage when you change tools. The flexible battery is backwards compatible with our 20V MAX* tools so you get up to 4X the runtime. (**With FLEXVOLT 60V MAX* battery when used with DEWALT 20V MAX* tools.) 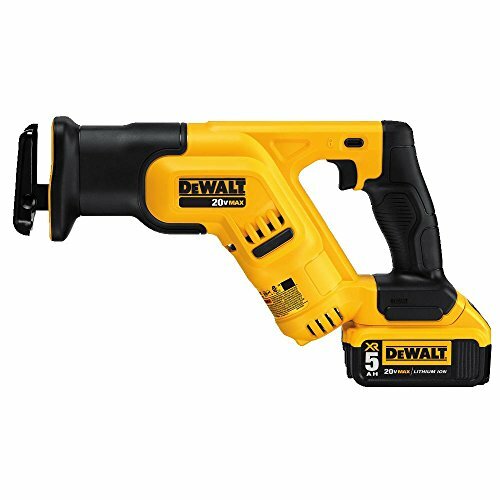 you can slide the battery into a whole new lineup of 60V MAX* and 120V MAX* tools from DEWALT. This reciprocating saw allows the power of corded with the freedom of cordless. It offers a keyless lever-action blade clamp for quick and easy blade changes, along with a variable speed trigger that allows user to instantly control speed. The 0 - 3000 SPD and 1 1/8" stroke length delivers fast and efficient cutting with a pivoting shoe that provides leverage for different applications. It can cut up to 158 cuts per charge in 2x4 using a flexible battery. This saw also has a LED light that helps to illuminate dark jobsite work areas, and features a rubber over mold grip for user comfort. 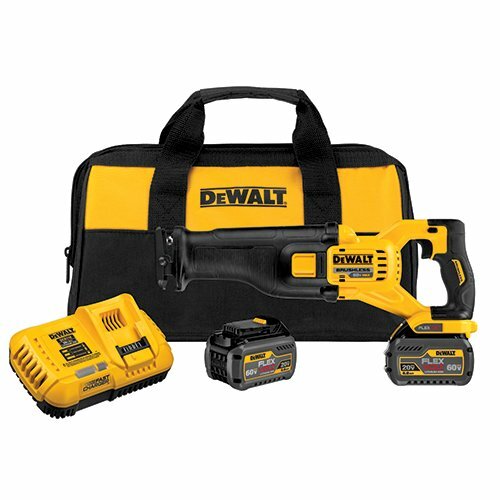 Kit includes: (1) dcs388b 60V MAX* Brushless Recip saw, (1) DCB606 battery, (1) DCB118 charger, (1) low vibration Recip saw blade. 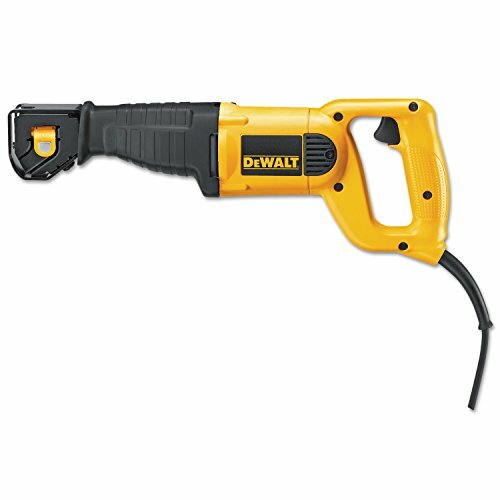 Looking for more Dewalt Recip Saw similar ideas? Try to explore these searches: Zip Cardigan, Polo Factory Outlet, and Blemish Fade Cream. Look at latest related video about Dewalt Recip Saw. Shopwizion.com is the smartest way for online shopping: compare prices of leading online shops for best deals around the web. 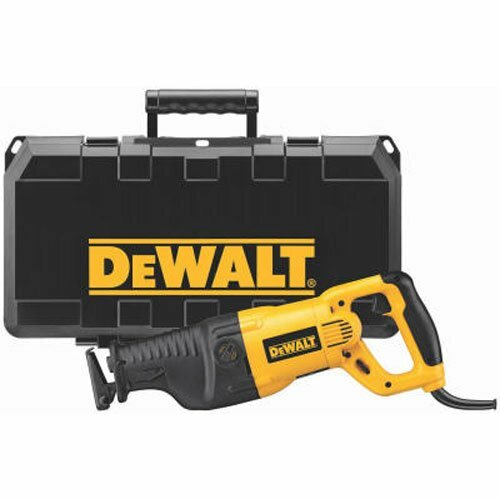 Don't miss TOP Dewalt Recip Saw deals, updated daily.